” Ever since I was a little girl, I have been working and playing with art for as long as I can remember. I have always been attracted towards and obsessed with color. When we are kids we play around fearlessly with the colors without worrying about how the end result would be. But as and when I was growing up, it was really not enough for me to play with colors. I wanted the end results too !! During my fine arts college, I remember making tons of failed and bad works only because I had not yet understood the proper use of colors, what combinations and contrasts work together and much more. Those bad works or failed attempts frustrated me, because every bad work also meant a ruined canvas and tons of paint gone waste, the time I lost and that feeling of a failed attempt too. But I never had a choice, as I just had to go through that. Only after going through those failed attempts, I am at a point where I now, after around 10 years have just barely started to understand color. My 10 years of failed experiments with colors in my fight to understand how they work and not so happy attempts could have really been minimized or I would have been more productive playing around with them, if at that time I would have had a book like COLORFLOW BY IVY NEWPORT , which is a color palette resource book. I am so proud of what Ivy and Chris has designed here with utmost care and intention. 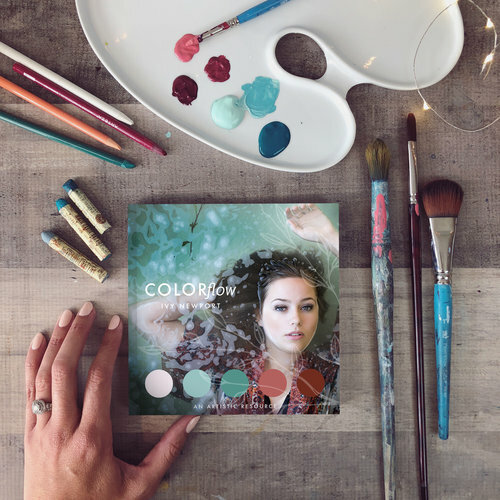 Each page is infused with vibrant color AND stunning imagery to ignite creativity and help build color confidence! You can use the color palettes as a guide to your piece or utilize the many photo references for sketching and painting! Which is just absolutely awesome. And this is an amazing book that can even be carried easily around if you are an onsite artist. Fun !! Fun !! Thanks a ton Ivy. This is one book I am really gonna get a use of and treasure with all my heart. CLICK HERE TO PURCHASE YOUR COPY NOW !! Ivy also so very generously shared with us this beautiful tutorial that she has created using the book and that gives us a better idea of how amazingly even we can use this book and personally the cherry on the cake for me was, that she is using Artyshils Art Brushes to create this beautiful Cardinal. Thankyou so much for reading till here. Your support means a lot to us. Feel free to write in the comments your feedback, reactions, questions and I will be happy to get back. Hope you have a wonderful day ahead.